We are massive fans of the Great British Pub & try to be as Pubby as we can every day in our little corner spot. We like to think that we are a Pub that serves food. Not a Restaurant that serves drinks. 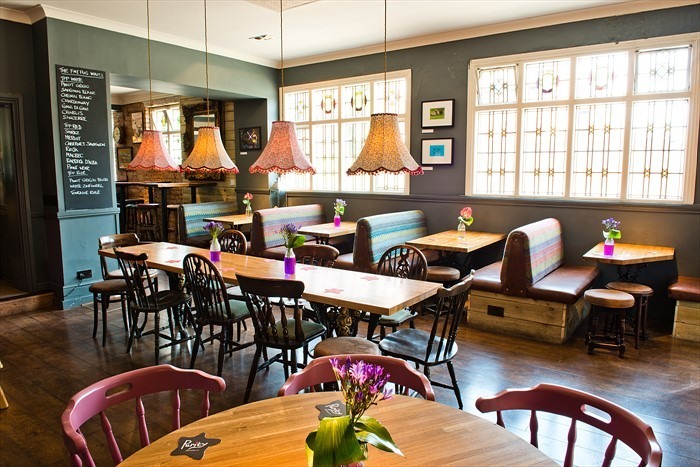 Being a pub, we will of course try and find a table for you no matter how many of you there are on arrival, or book now online. We do also have a splendid private dining room, which can accommodate up to 14 people for a sit down meal (a few more for a buffet) and is an ideal space for small meetings. All of our pizzas are handmade into a rustic square(ish) shape and topped with our special recipe Pug Pubs tomato sauce & a perfect blend of mozzarella & cheddar cheese. 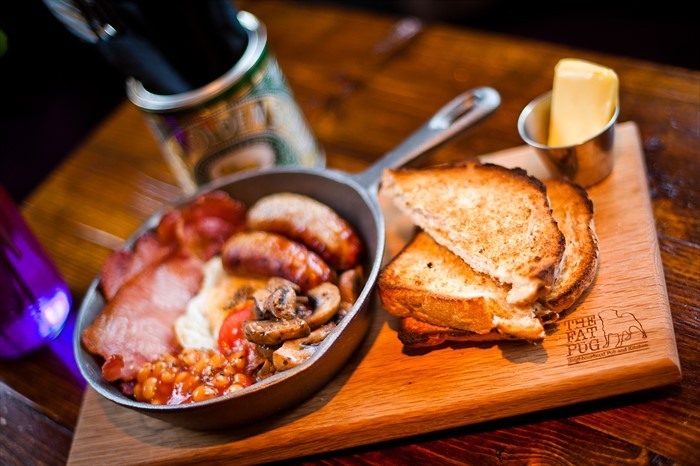 We also serve brunch, pizzas and a bunch of our delicious mains! Our favourite pairings. All served with Fever-Tree Premium Mixers & the perfect garnish to complement your chosen Gin. It’s our house red, great for drinking. Fruity, hints of vanilla, a decent red. Just drink it. A well rounded, medium bodied soft wine, deep ruby red. Sensible. A bright wine with red berry aromas and notes of liquorice. A personal favourite. A mix of plum, raspberry and blackberry, medium bodied. Great with friends or just have the bottle to yourself. It’s our house white. Peach aromas with fresh pear. Crispy. Goes with the usual food suspects, but I’d drink it with more wine. This cracking Pinot has a light citrus aroma, a mixture of juicy fruits and a hint of vanilla. Decent Sauv Blanc, crisp grapefruit flavour, still nice and dry with hints of lemon and lime. Top notch NZ Sauv Blanc, passion fruit, gooseberry, melon. Crisp dry finish. Goes well with a flash car on a long lease, or the latest iPhone. Off-dry, loads of citrus and pineapple aromas. Well balanced and refreshing, clean finish. Bright salmon pink colour, if you like beer you will hate this wine, brilliant if you are into fruity vapes. Light fresh strawberry flavours, very easy drinking, good with sunshine. Straw yellow, subtle with a fruity scent and hints of apple. Dry, crisp and fruity palate, clean finish. Rose pink colour, petals and fresh strawberries. Clean, crisp and vibrant. Laurent-Perrier’s signature champagne, La Cuvée is delicate yet complex with crisp notes of citrus fruit and white flowers. Perfect drop for any celebration, ideal for weekend millionaires, great with a second bottle. Very rock and roll for breakfast! We also offer a selection of our wines by the glass in 125ml, 175ml & 250ml measures, these are listed on the menu. Thank you! We will get in touch as soon as we can. Please allow 5 working days before getting in touch again. Sign up to receive Pug News! Sign up with your email address to receive news and marketing updates. This section is for us to brag about how great we are! But also, so you know you are in the best hands when you visit us here at The Fat Pug. The annual star pub awards announced The Fat Pug as The Best Innovative Pub 2019, and we couldn’t be more proud!! Winner of 2018’s Best Destination Pub Warwickshire!